The Rhythm Pattern feature introduced in MODX is useful for practice and production. This article will show you how to use this cool feature in these two use cases. Accessing the Rhythm Pattern Feature. You can add a Rhythm Pattern to any Performance by pressing the [RHYTHYM PATTERN] button located at the bottom left of the Touchscreen adjacent to the [CONTROL ASSIGN] button. It illuminates automatically when you have selected a Performance. To stop Arpeggio playback either press the Transport [STOP] button located directly above the [RHYTHM PATTERN] or touch the [ARP ON/OFF] button on the far left side of the keyboard. Practicing with a metronome is a great way to improve time feel and your ability to play with other musicians, especially drummers. Because there are literally thousands of high-quality drum arpeggios in MODX you can use the Rhythm Pattern feature to play to a very hip metronome! 3. Select a jazz drum kit to play to a swinging drum Arpeggio. Production: Adding a Drum Groove to Arpeggio Performances. There are many Arpeggio Performances in MODX that have no drum groove and the Rhythm Pattern feature is a great way to add them. For this example, I have selected the Performance “Motion Pad”, A 5-Part Performance with no drum part. Take a moment and check out this Performance: It has some great movement and textures. Touch the [RHYTHM PATTERN] button and select the drum kit “T’s EDM Kit 2”. Once selected as soon as you touch a key the Drum Arp will play along with the rest of the Arpeggio Parts. To exit press the [PERFORMANCE (HOME)] button. 1. Use the Cutoff and Resonance knobs to adjust the filter for different variations and touch the Knob Function button to adjust the gate time of the Arpeggios. To adjust all the Part of the Performance simultaneously touch the [PERFORMANCE (HOME)]; to adjust Parts individually, touch the [PART SELECT MUTE/SOLO] button and touch individual Parts). 2. 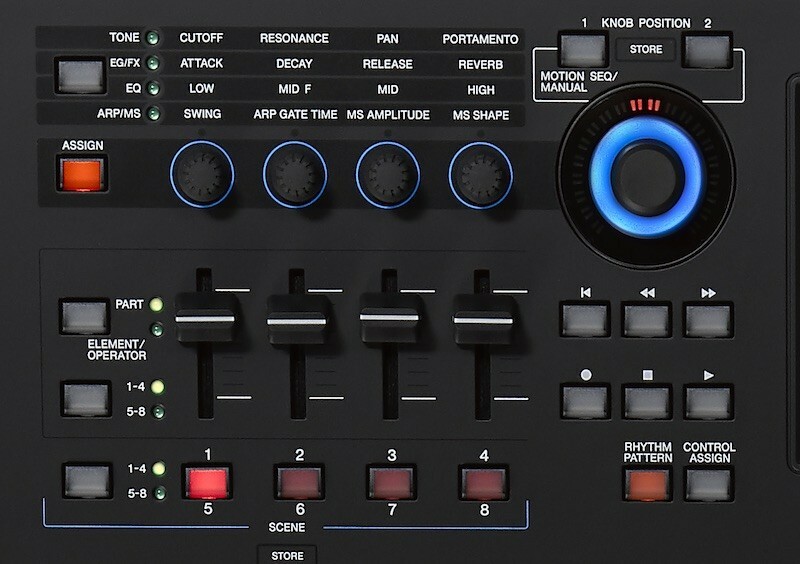 Keep pressing the Knob Function button to access each level (TONE, EG/FX, EQ and ARP/MS). Use these other mixing features to further change the overall sound. 3. Adjust SWING and ARP GATE TIME to change the feel and gate rate of the Arpeggios. Again: To adjust all the Part of the Performance simultaneously touch the [PERFORMANCE (HOME)]; to adjust Parts individually, touch the [PART SELECT MUTE/SOLO] button and touch individual Parts). You may have noticed the shortcut to the Envelope Follower in the Rhythm Pattern screen. More on that in the next article! Have questions or want to share your thoughts? Join the conversation on the Forum here.